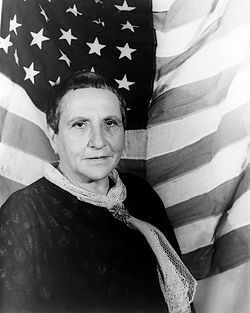 Gertrude Stein (February 3, 1874 – July 27, 1946), an American modernist writer, is often viewed as one of the principal leaders and catalysts of the modernist movement in American literature. Stein became the figurehead for the entire "Lost Generation" of American expatriate artists and writers who lived in France during the period between the First and Second World Wars. Her influence, both directly as a writer and indirectly as a patron and supporter of her fellow artists, was inestimable in the development of American literature in the first half of the twentieth century. Among those whom Stein took under her wing were novelists such as Ernest Hemingway, poets such as Ezra Pound, and artists such as Pablo Picasso. By bringing a number of disaffected artists and writers together within her large social circle, Stein directly assisted in the rapid development of new and experimental ideas in both literature and the visual arts. Moreover, Stein's fiction, which is among the most abstract and formally innovative of all Modernist writing, would directly inspire a number of her contemporaries to continue their own experiments with form and content that would collectively revolutionize the landscape of twentieth-century literature. Although Stein's works are not as famous or as widely taught as those of some of her colleagues and contemporaries, she is nevertheless acknowledged as one of the seminal influences in the history of twentieth-century American fiction. In 1902, Stein moved to France during the height of artistic creativity gathering in Montparnasse. From 1903 to 1912, she lived in Paris, where she met her life-long companion, Alice B. Toklas. During most of her life, Gertrude, like her siblings, lived off a stipend from her father's estate, which her brother Michael very capably stewarded and invested. After the success of her memoir "The Autobiography of Alice B. Toklas" in the mid-1930s, Stein became rich in her own right. When Britain declared war on Germany in World War I, Stein and Toklas were visiting Alfred North Whitehead in England. Following the war, Stein began holding regular salons at her home at 27 Rue de Fleurus, which attracted many of the great artists and writers living in Paris at that time, including Ernest Hemingway, Ezra Pound, Henri Matisse, Thornton Wilder, Sherwood Anderson, and Guillaume Apollinaire. Around this time Stein coined the term "Lost Generation" for the generation of writers and artists living in the aftermath of World War I with its powerful assault on the hopes of many who who had thought history was progressing toward a freer, fairer, and more just society. At the personal level, Stein was extremely charming, eloquent, and cheerful, and she developed her salon gatherings into a large and highly productive social circle. With the outbreak of World War II, the salons came to an end, and Stein and Toklas moved to a country home that they had rented for many years previously in Bilignin, Ain, in the Rhône-Alpes region. Referred to only as "Americans" by their neighbors, the Jewish Gertrude and Alice were able to escape persecution because of their friendship with Bernard Faÿ, a collaborator of the Vichy regime with connections to the Gestapo. After the war, Gertrude's status in Paris grew when many young American soldiers visited her. She died at the age of 72 from stomach cancer in Neuilly-sur-Seine on July 27, 1946, and was interred in Paris in the Père Lachaise cemetery. In one account by Toklas, when Stein was being wheeled into the operating room for surgery on her stomach, she asked Toklas, "What is the answer?" When Toklas did not answer, Stein said, "In that case, what is the question?" "Out of kindness comes redness and out of rudeness comes rapid same question, out of an eye comes research, out of selection comes painful cattle." "The change of color is likely and a difference a very little difference is prepared. Sugar is not a vegetable." These stream-of-consciousness experiments, rhythmical word-paintings or "portraits," were designed to evoke "the excitingness of pure being" and can be seen as an answer to cubism in literature. Many of the experimental works such as Tender Buttons have since been interpreted by critics as a feminist reworking of patriarchal language. These works were loved by the avant-garde, but mainstream success initially remained elusive. It is important not to underrate Stein's works immediately because of their seeming idiosyncrasies. As critic Judy Grahn says of Stein's work, "the whole field of the canvas is important." Rather than a "figure/ground" relationship, "Stein in her work with words used the entire text as a field in which every element mattered as much as any other." It is a subjective relationship that includes more than one viewpoint, and to quote Stein: "The important thing is that you must have deep down as the deepest thing in you a sense of equality." Though Stein influenced authors such as Ernest Hemingway and Richard Wright, her work has often been misunderstood. Composer Constant Lambert (1936) naively compares Stravinsky's choice of, "the drabbest and least significant phrases," in L'Histoire du Soldat to Gertrude Stein's in "Helen Furr and Georgine Skeene" (1922), specifically: "Everyday they were gay there, they were regularly gay there everyday," of which he contends that the, "effect would be equally appreciated by someone with no knowledge of English whatsoever." In 1932, using an accessible style to accommodate the ordinary reading public, she wrote The Autobiography of Alice B. Toklas; the book would become her first best-seller. Despite the title, it was really her own autobiography. ↑ Photo of Gertrude Stein at Johns Hopkins Medical School Retrieved May 10, 2007. ↑ Janet Malcom, “Someone Says Yes to It: Gertrude Stein, Alice B. Toklas, and ‘The Making of the Americans,’” New Yorker, June 13–20, 2005, 148–165. Malcom, Janet, “Gertrude Stein's War.” New Yorker, June 2, 2003, 58–81. Truong, Monique. The Book of Salt. Boston: Houghton Mifflin Company, 2003. A novel about a young Vietnamese cook who worked in Stein's Montparnasse-household. This page was last modified on 20 June 2017, at 20:32.